This unconventional and unique red carbon fiber inlay leather bracelet is perfect for anyone who wants a modern look or wants to support a cause. Red carbon fiber is set in stainless steel which complements leather and creates an exquisite look. 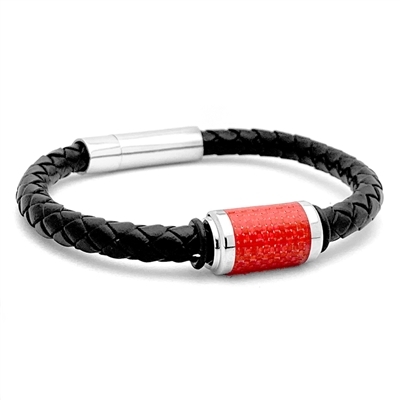 Red carbon fiber is sealed to prevent water damage and gives the bead a consistent, smooth finish that matches the texture of the metal.